Florence Folio Display Easel is a uniquely designed portfolio for professional artists and students. Present your work in style with a portfolio that turns into an easel, making it easy to show your work in interviews, assessments and general show tell moments. 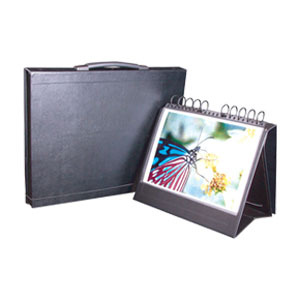 Florence Folio Display Easel is made from thick hard board with a leather grained vinyl for protection and style. Comes with 10 sleeves. Can hold up to 40-50 sleeves depending on thickness of your work.